Proficiency in ultrasound takes practice. This ultrasound workshop will give you the foundations to do more in the clinic for your patients. A great machine can only be effective if the user knows how to use it. This workshop allows you to learn from specialists, develop practical skill in abdominal ultrasound and discover what your ultrasound equipment is capable of. Join us for the opportunity to get hands-on scanning experience in small groups of only 3 people. You will have the guidance of tutors as well as a technical product specialist to help you get the best possible image. This year, the ultrasound workshop will be held in Kangaroo Point, Australia. The cost of attending this course is AUD $2,250.00 ex GST per person for existing CenQuip / Cenvet customers. Above all, the workshop is perfect if you have an existing ultrasound machine that you would like to learn more about or if you are looking to upgrade your current ultrasound machine in the future. Don’t miss out on this incredible learning experience! Places in the ultrasound workshop are limited – please book early to avoid any disappointment. * T&C’s apply, available while stock lasts. 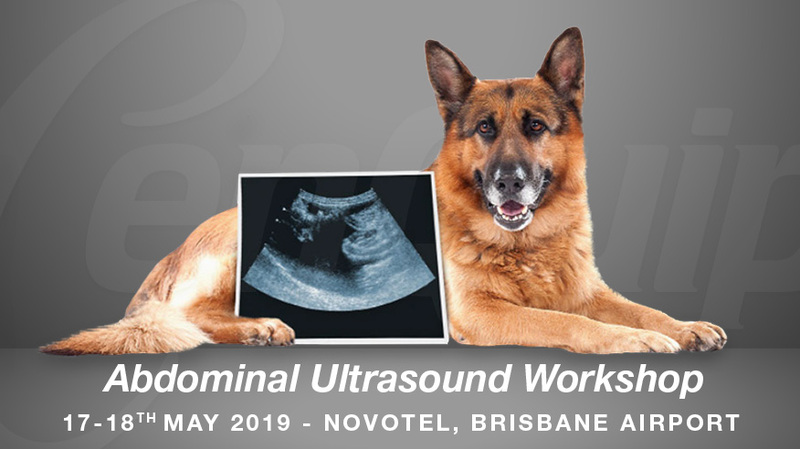 ** Ultrasound Workshop is held in Kangaroo Point, QLD , Australia 17-18 May 2019. All course-related meals and expenses covered, travel and accommodation are to be organised and paid for by the individual attending the workshop.